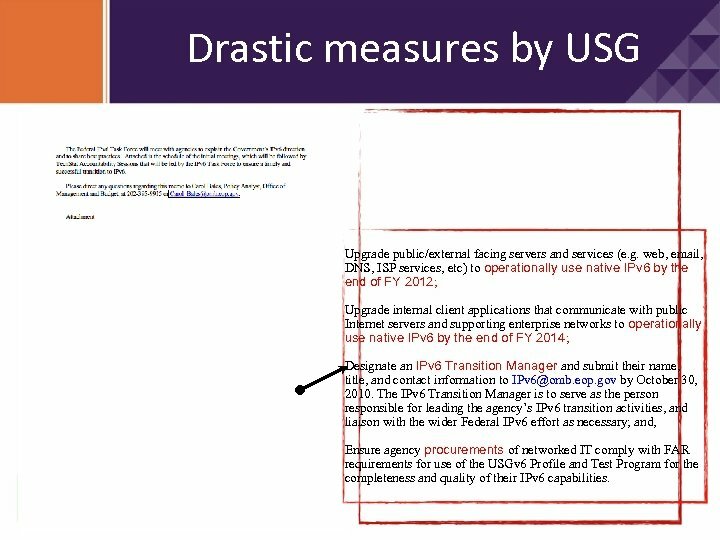 Drastic measures by USG Upgrade public/external facing servers and services (e. g. web, email, DNS, ISP services, etc) to operationally use native IPv 6 by the end of FY 2012; Upgrade internal client applications that communicate with public Internet servers and supporting enterprise networks to operationally use native IPv 6 by the end of FY 2014; Designate an IPv 6 Transition Manager and submit their name, title, and contact information to IPv [email protected] eop. gov by October 30, 2010. 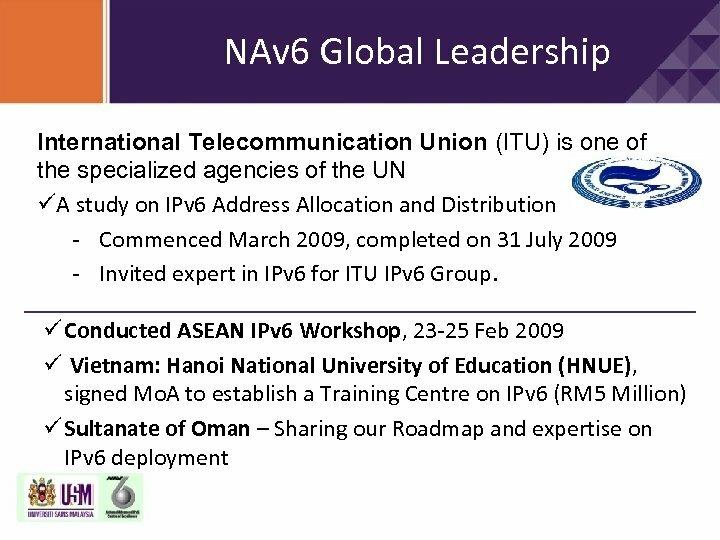 The IPv 6 Transition Manager is to serve as the person responsible for leading the agency’s IPv 6 transition activities, and liaison with the wider Federal IPv 6 effort as necessary; and, Ensure agency procurements of networked IT comply with FAR requirements for use of the USGv 6 Profile and Test Program for the completeness and quality of their IPv 6 capabilities. 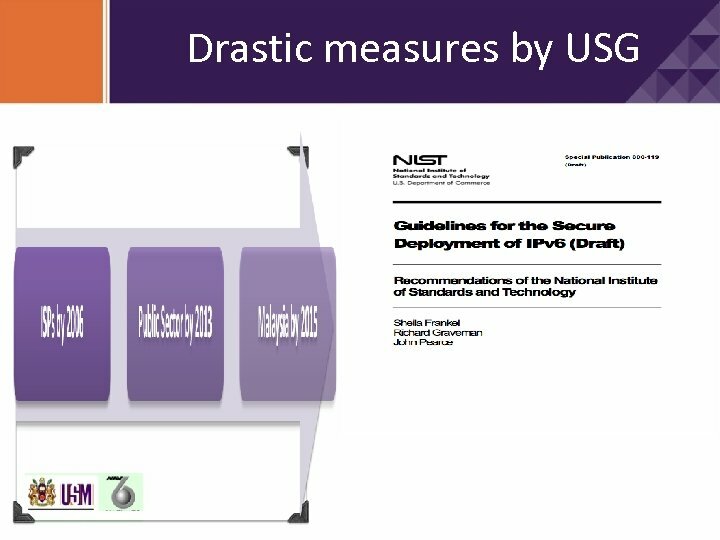 Drastic measures by USG Release Date: February 2010 The purpose of Guidelines for the Secure Deployment of IPv 6 is to provide information security guidance to organizations that are planning to deploy IPv 6 technologies or are simply seeking a better understanding of IPv 6. 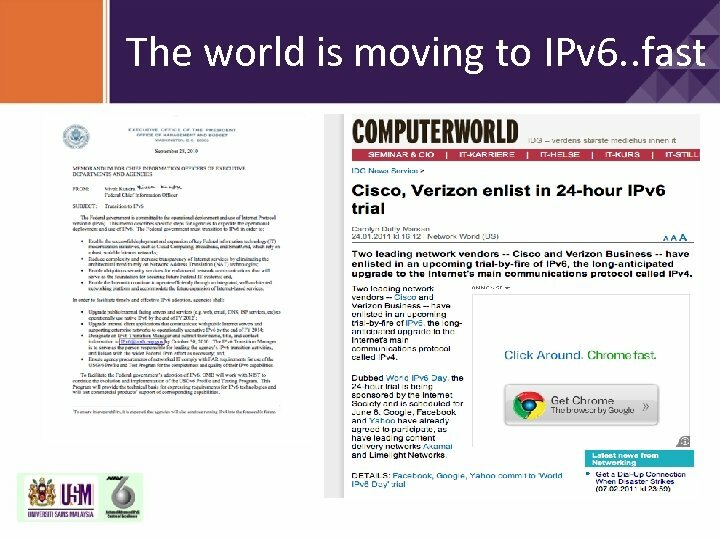 The scope of this document encompasses the IPv 6 protocol and related protocol specifications. 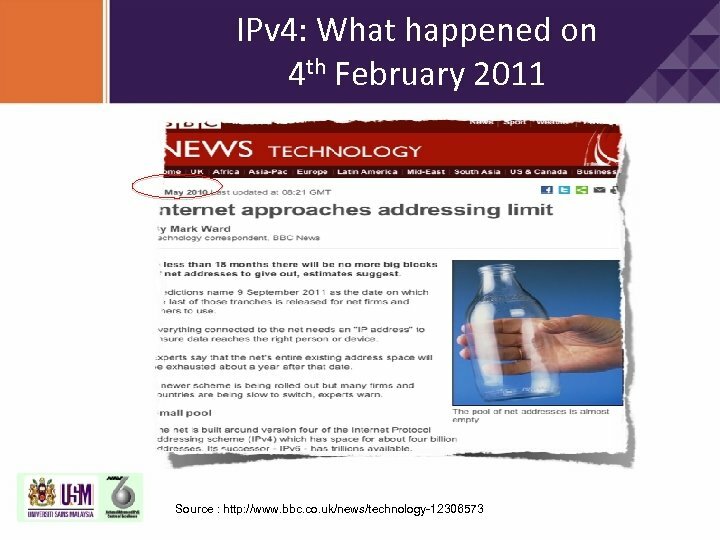 IPv 6 -related security considerations are discussed with emphasis on deployment-related security concerns. 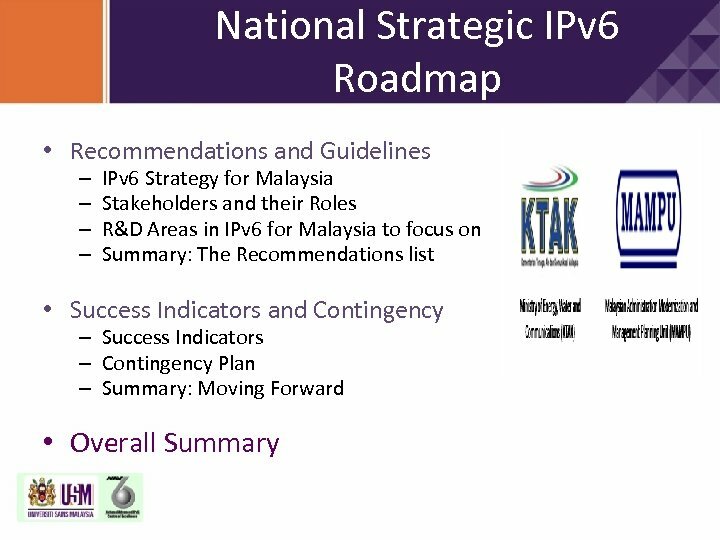 The document also includes general guidance on secure IPv 6 deployment and integration planning. 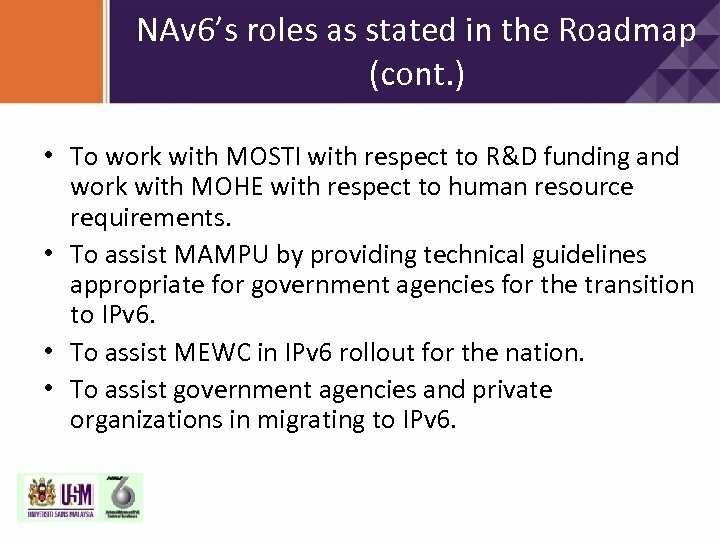 NAv 6’s Roles & Responsibilities • Core R & D – Continuous research, experiment and development of new applications and porting existing applications to IPv 6. 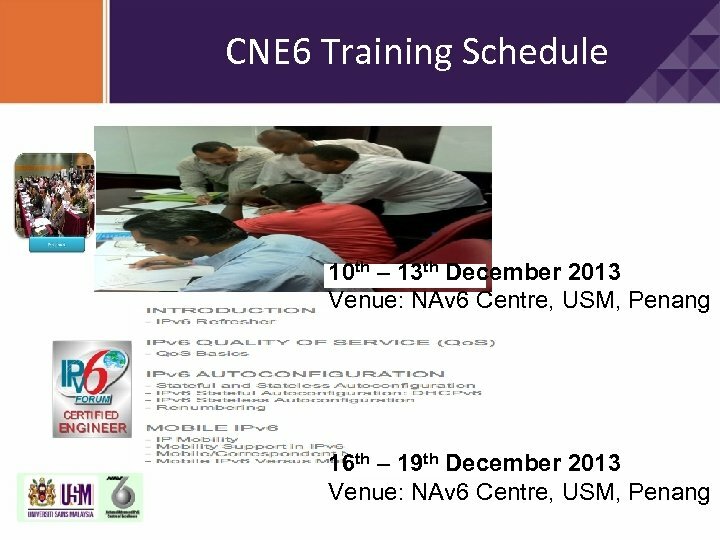 • Training & Human Resources – To train and nurture IPv 6 experts for Malaysia and the region. 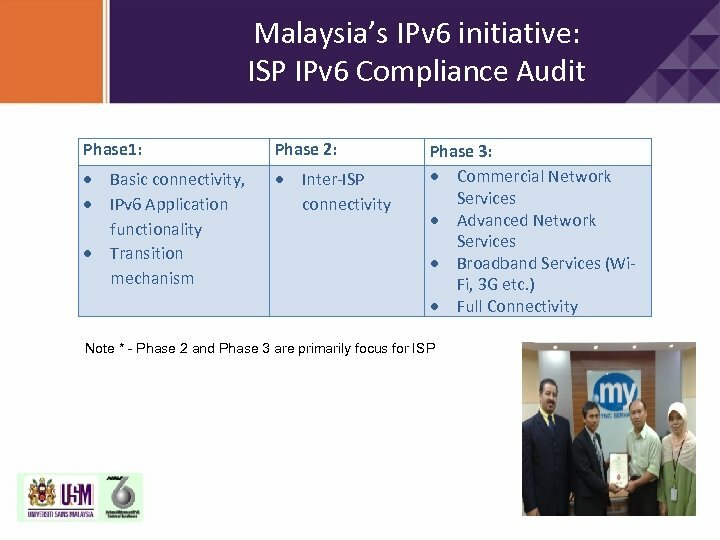 • Monitoring & Audit – To study and monitor the IPv 4 to IPv 6 transition in Malaysia as well as monitoring the regional development. 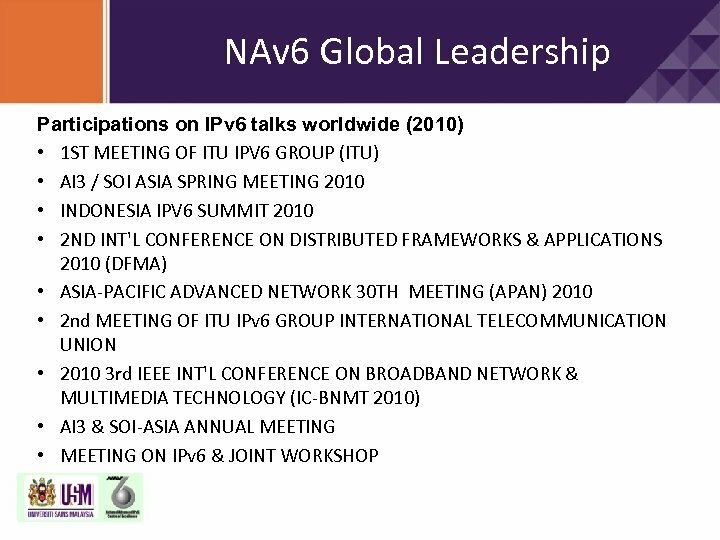 • Awareness and Promotion – To promote awareness on IPv 6. 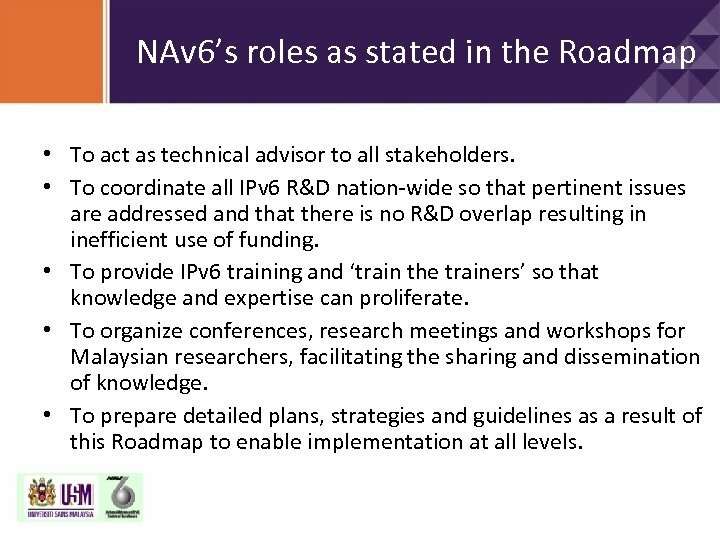 NAv 6’s roles as stated in the Roadmap • To act as technical advisor to all stakeholders. 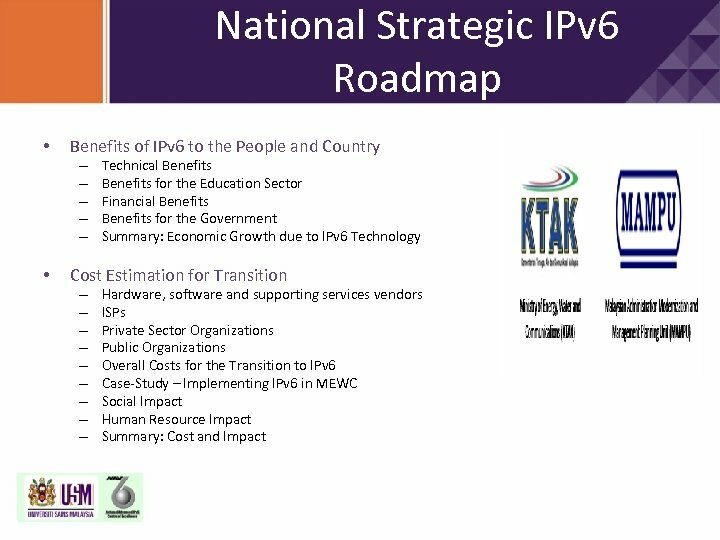 • To coordinate all IPv 6 R&D nation-wide so that pertinent issues are addressed and that there is no R&D overlap resulting in inefficient use of funding. 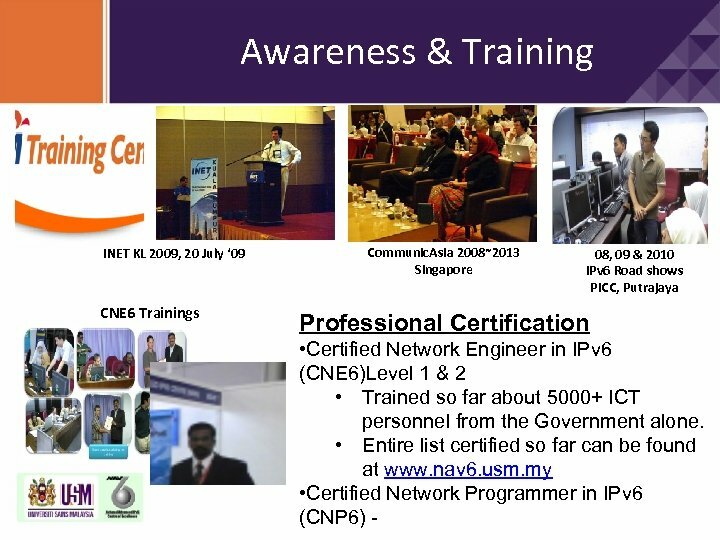 • To provide IPv 6 training and ‘train the trainers’ so that knowledge and expertise can proliferate. 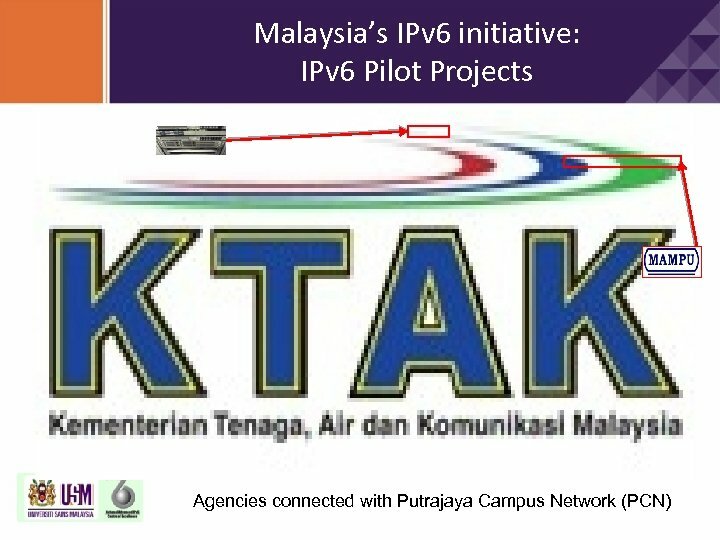 • To organize conferences, research meetings and workshops for Malaysian researchers, facilitating the sharing and dissemination of knowledge. 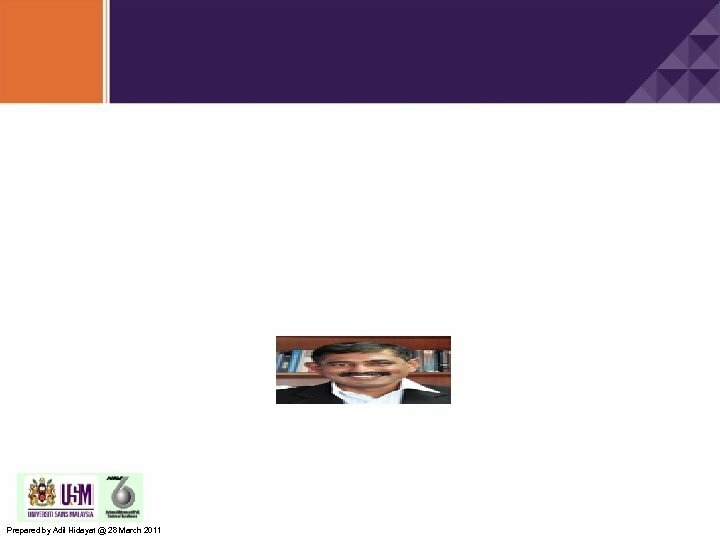 • To prepare detailed plans, strategies and guidelines as a result of this Roadmap to enable implementation at all levels. 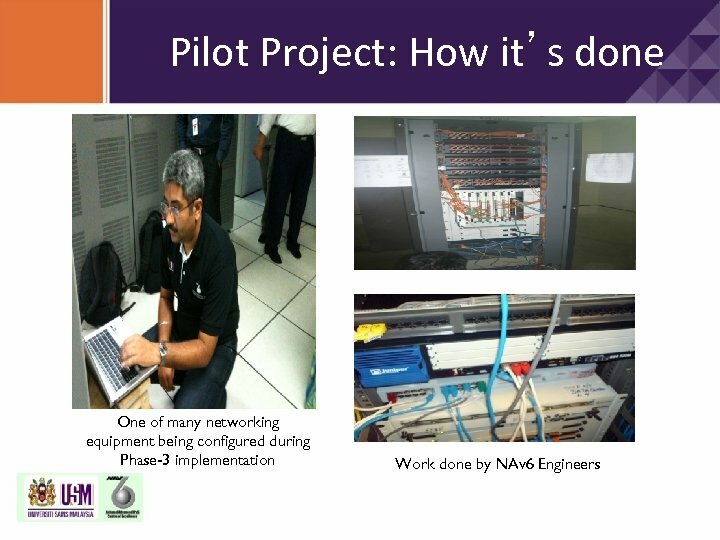 NAv 6’s roles as stated in the Roadmap (cont. ) 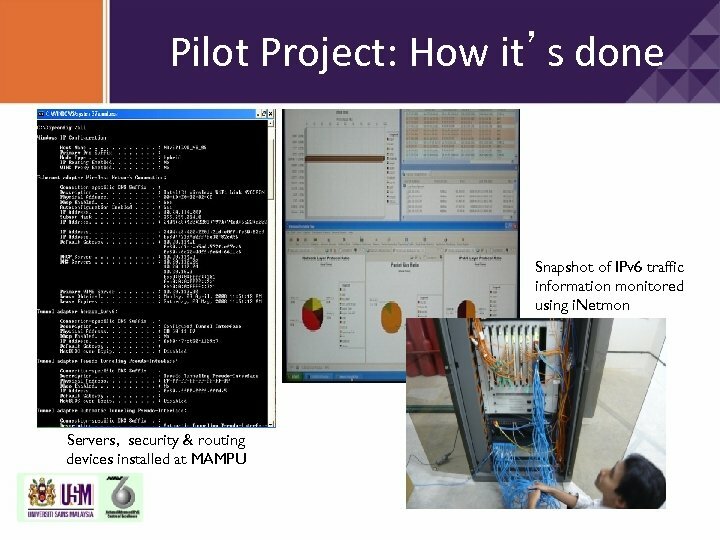 • To work with MOSTI with respect to R&D funding and work with MOHE with respect to human resource requirements. 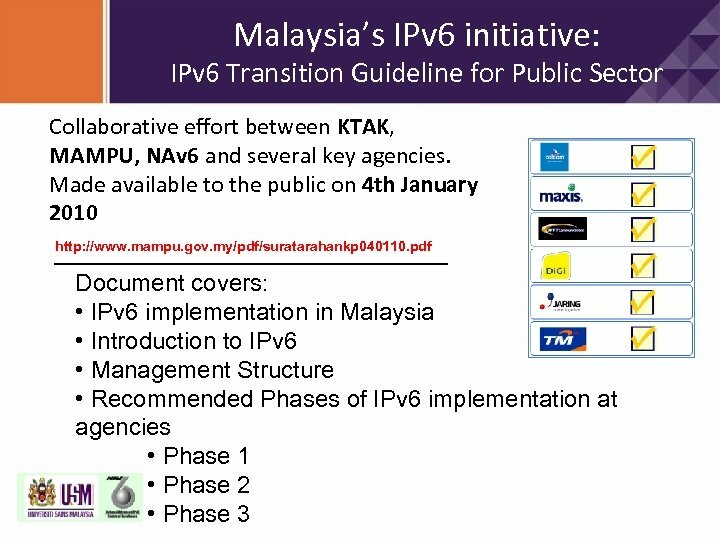 • To assist MAMPU by providing technical guidelines appropriate for government agencies for the transition to IPv 6. 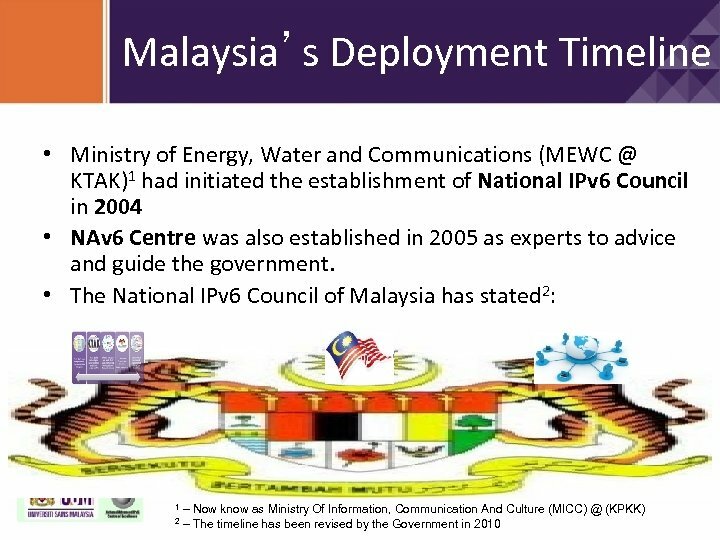 • To assist MEWC in IPv 6 rollout for the nation. 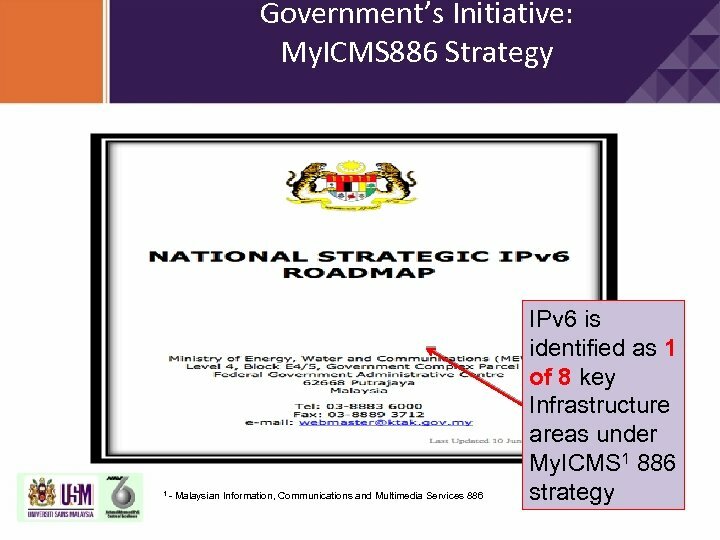 • To assist government agencies and private organizations in migrating to IPv 6. 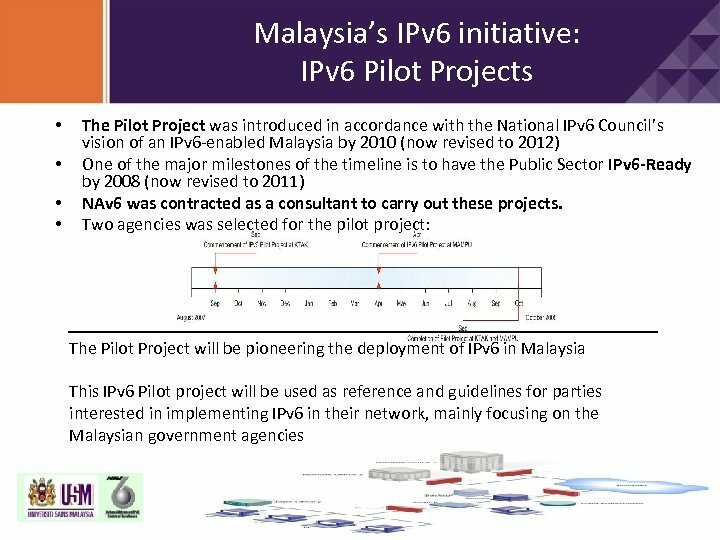 Malaysia’s IPv 6 initiative: IPv 6 Pilot Projects IPv 6 Pilot Project Objectives Establish basic IPv 6 capability in within the agency’s network. 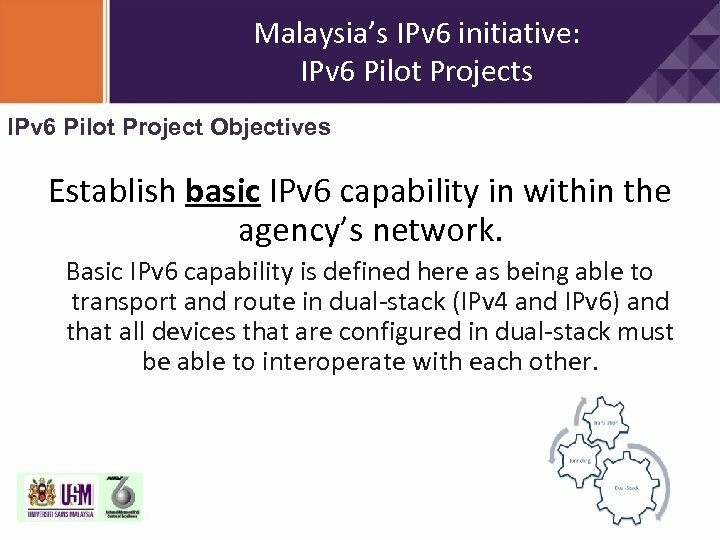 Basic IPv 6 capability is defined here as being able to transport and route in dual-stack (IPv 4 and IPv 6) and that all devices that are configured in dual-stack must be able to interoperate with each other. 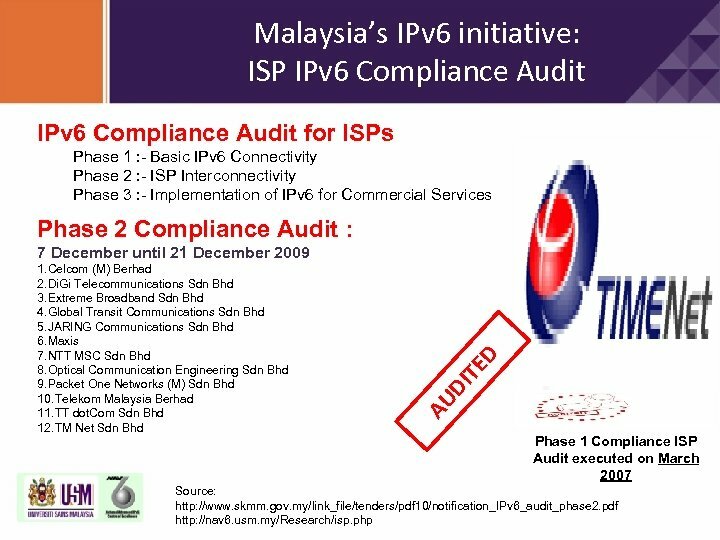 Malaysia’s IPv 6 initiative: IPv 6 Compliance Audit AU DIT ED Another achievement for the global IPv 6 community. • • . 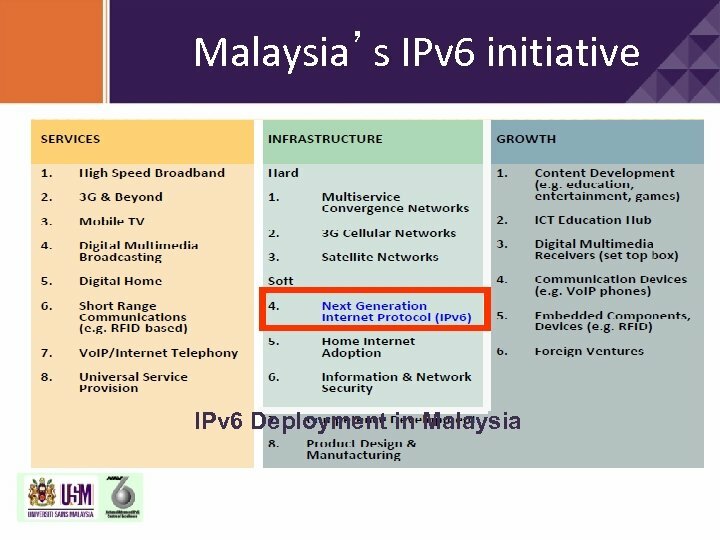 MY Domain Registry is IPv 6 enabled The Malaysian. 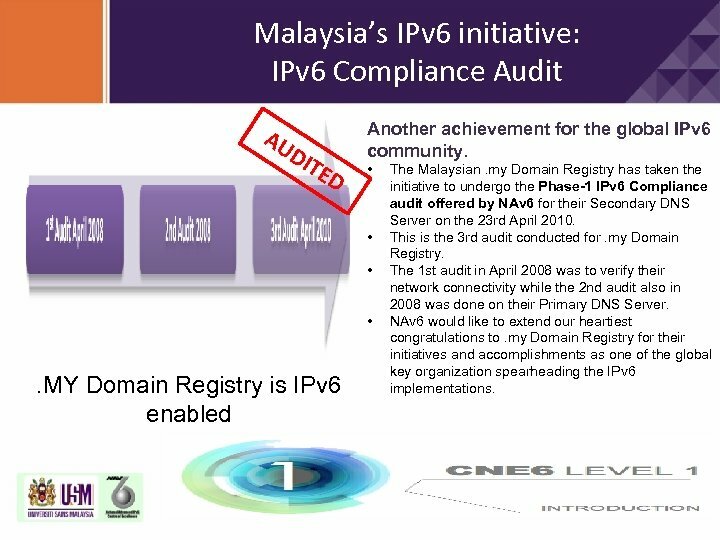 my Domain Registry has taken the initiative to undergo the Phase-1 IPv 6 Compliance audit offered by NAv 6 for their Secondary DNS Server on the 23 rd April 2010. 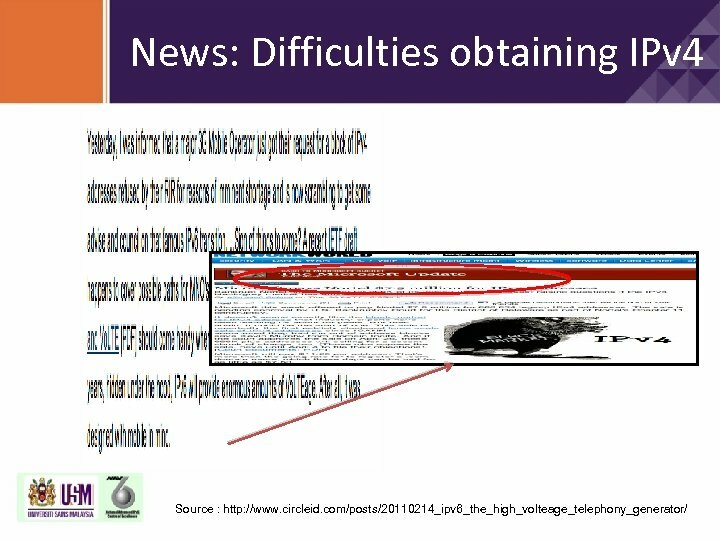 This is the 3 rd audit conducted for. 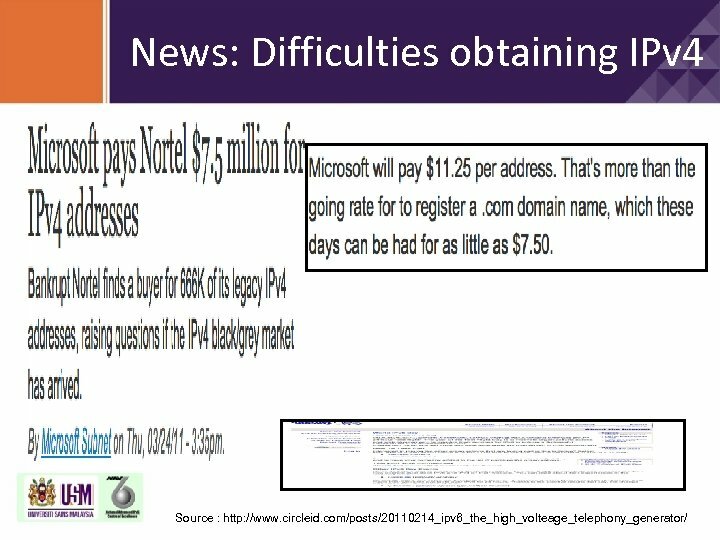 my Domain Registry. 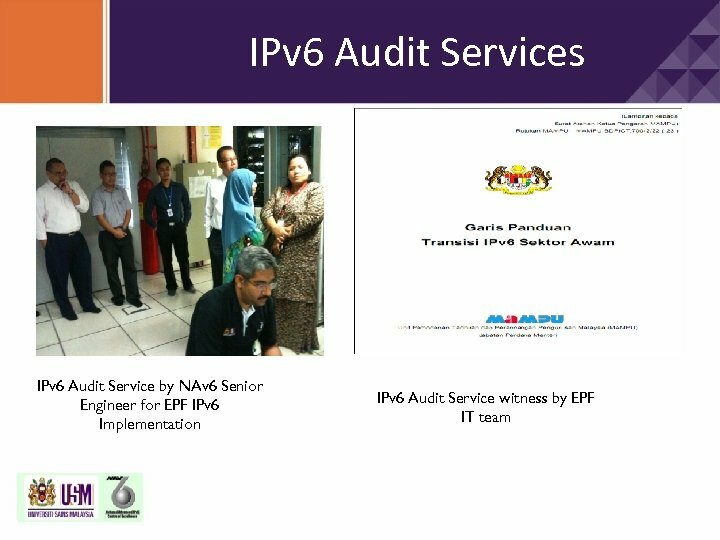 The 1 st audit in April 2008 was to verify their network connectivity while the 2 nd audit also in 2008 was done on their Primary DNS Server. 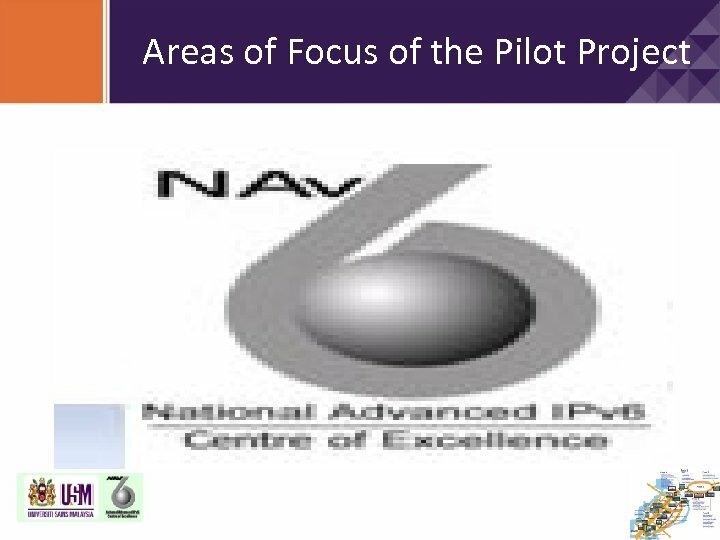 NAv 6 would like to extend our heartiest congratulations to. 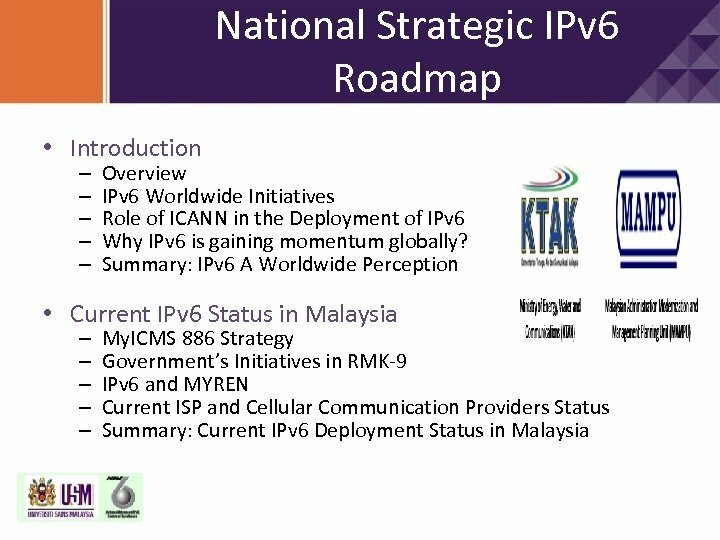 my Domain Registry for their initiatives and accomplishments as one of the global key organization spearheading the IPv 6 implementations. 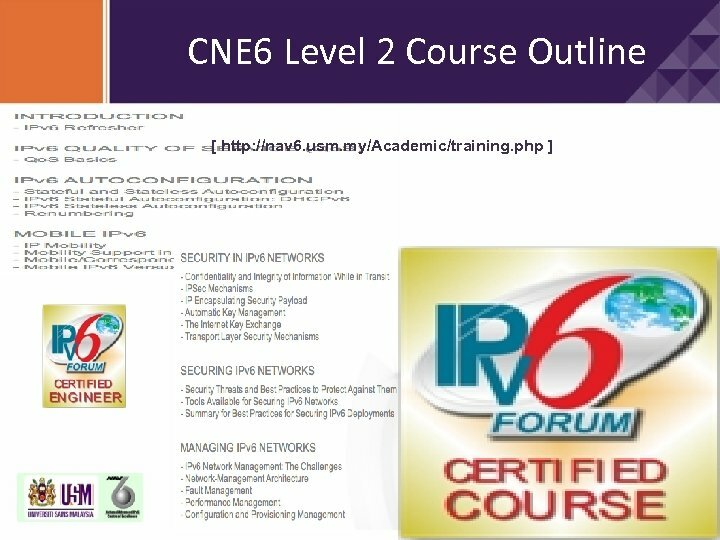 Building Human Resource: Certified IPv 6 Network Engineer (CNE 6) [ http: //nav 6. usm. my/Academic/training. 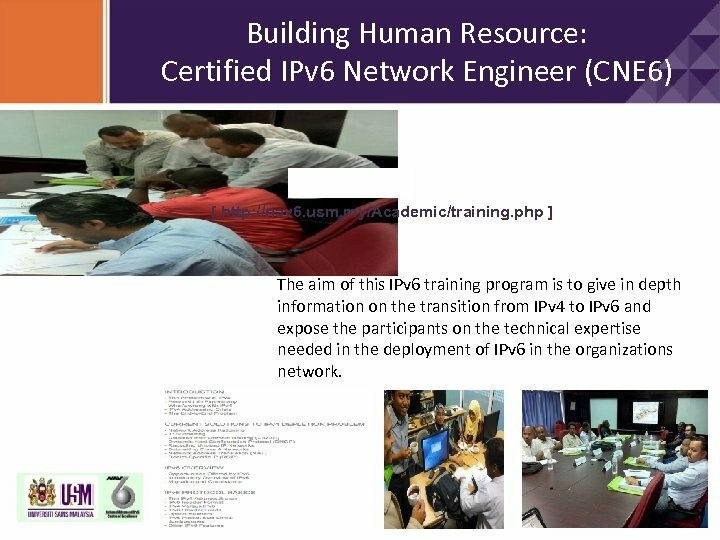 php ] The aim of this IPv 6 training program is to give in depth information on the transition from IPv 4 to IPv 6 and expose the participants on the technical expertise needed in the deployment of IPv 6 in the organizations network. 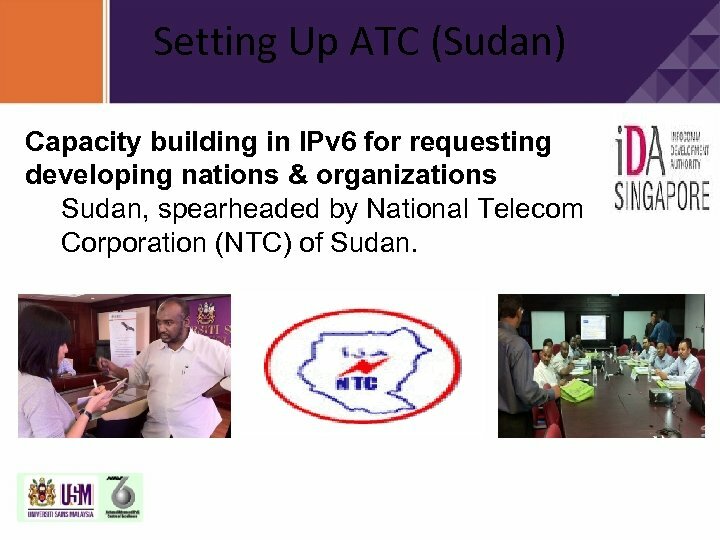 Setting Up ATC (Sudan) Capacity building in IPv 6 for requesting developing nations & organizations Sudan, spearheaded by National Telecom Corporation (NTC) of Sudan. 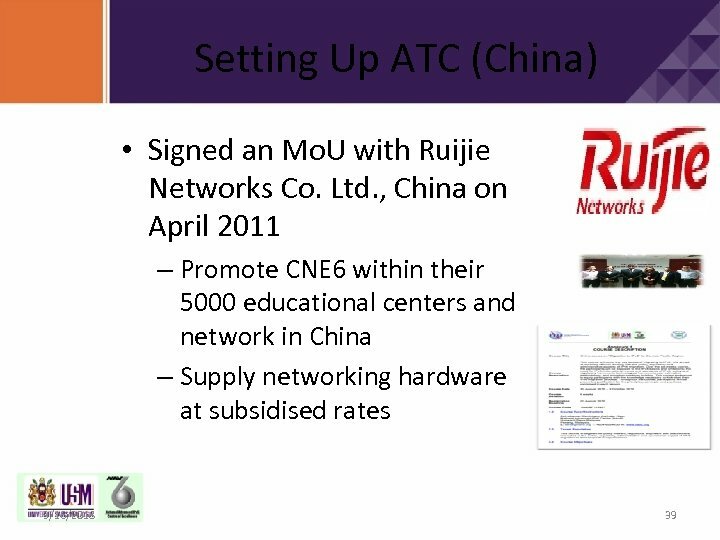 Awareness & Training ITU Asia-Pacific Centre of Excellence: Online course on “Migration to IPv 6” for the Asia Pacific Region. 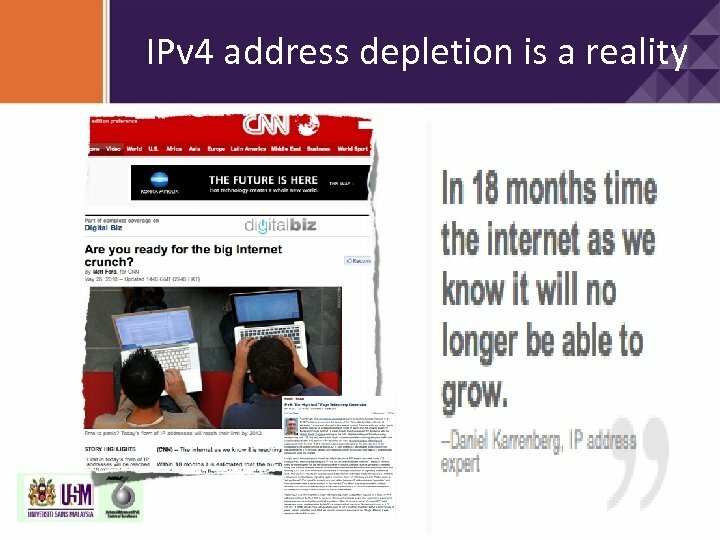 • This course will cover the key issues of migrating to IPv 6. 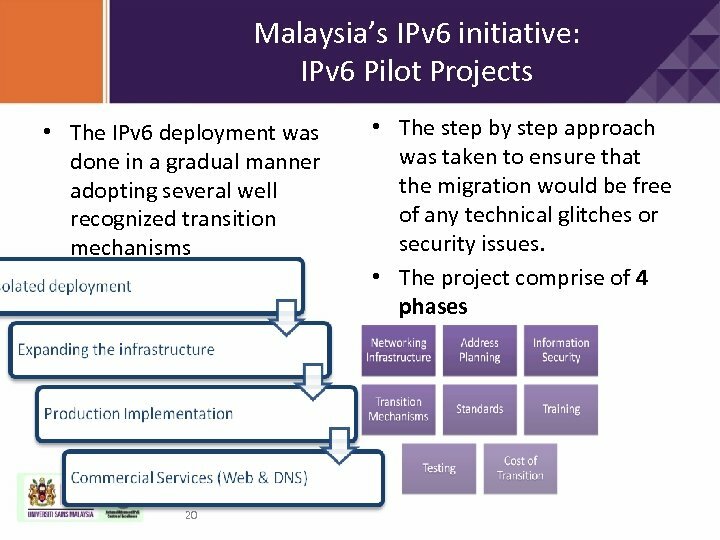 • It is aimed at assisting officials dealing with the policy, regulatory and administrative aspects of IPv 6 migration. 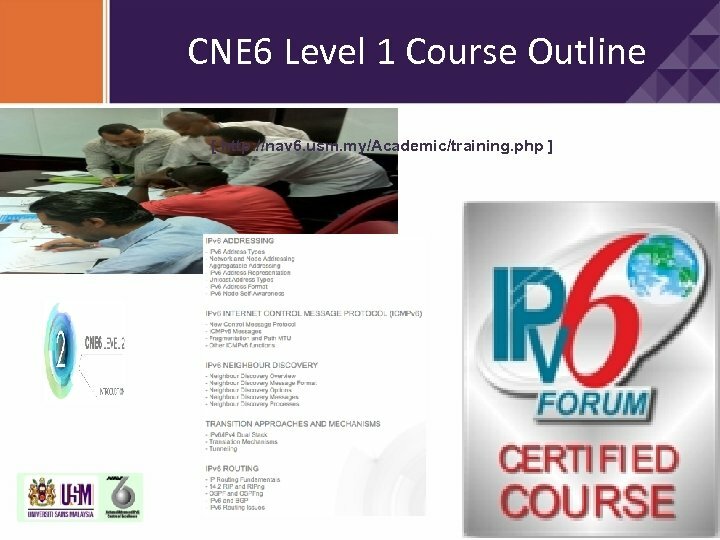 • Over the six weeks course. 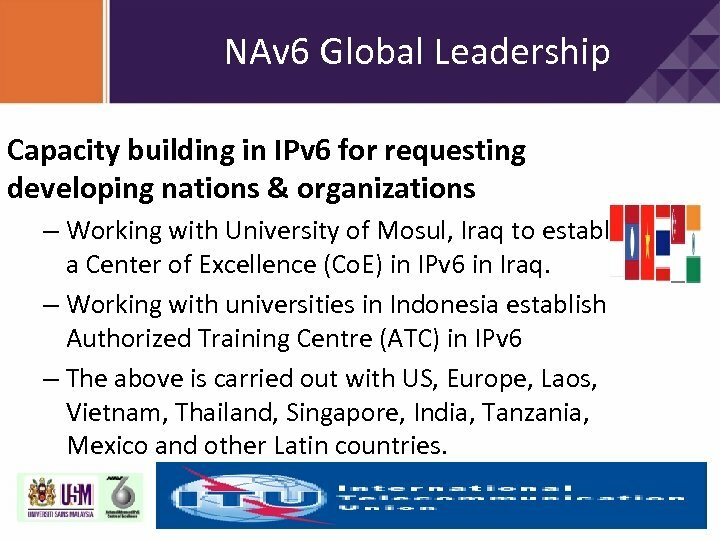 NAv 6 Global Leadership Capacity building in IPv 6 for requesting developing nations & organizations – Working with University of Mosul, Iraq to establish a Center of Excellence (Co. E) in IPv 6 in Iraq. 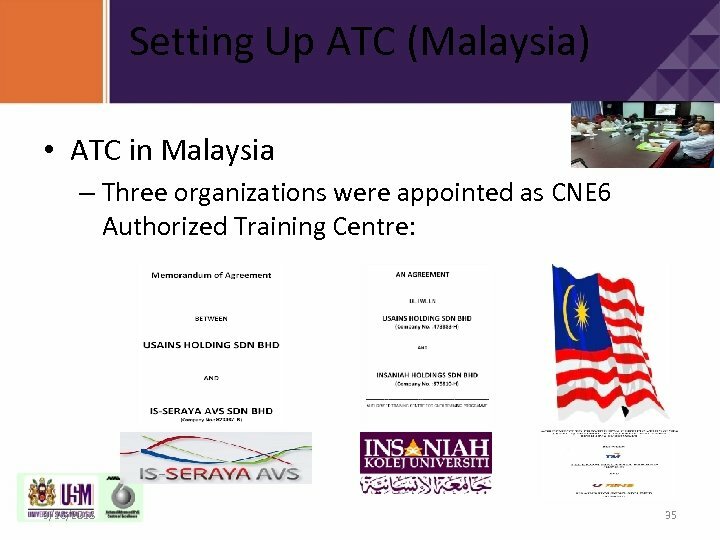 – Working with universities in Indonesia establish Authorized Training Centre (ATC) in IPv 6 – The above is carried out with US, Europe, Laos, Vietnam, Thailand, Singapore, India, Tanzania, Mexico and other Latin countries. 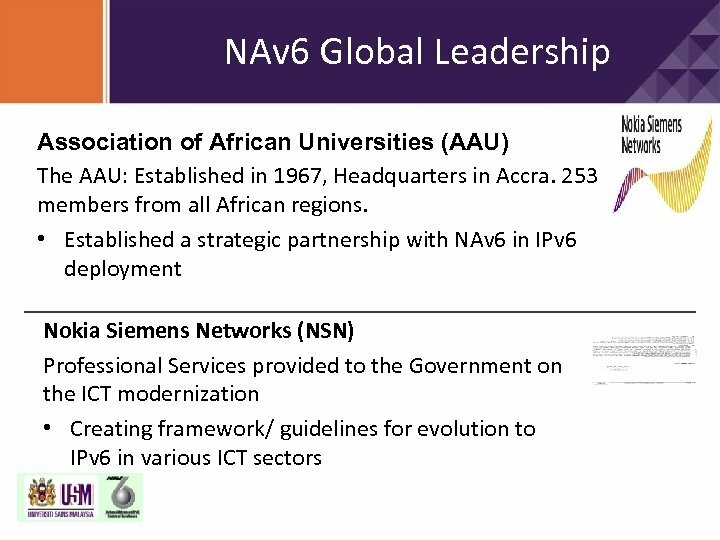 NAv 6 Global Leadership Internet Innovation Union Establishment Conferences & Workshop. 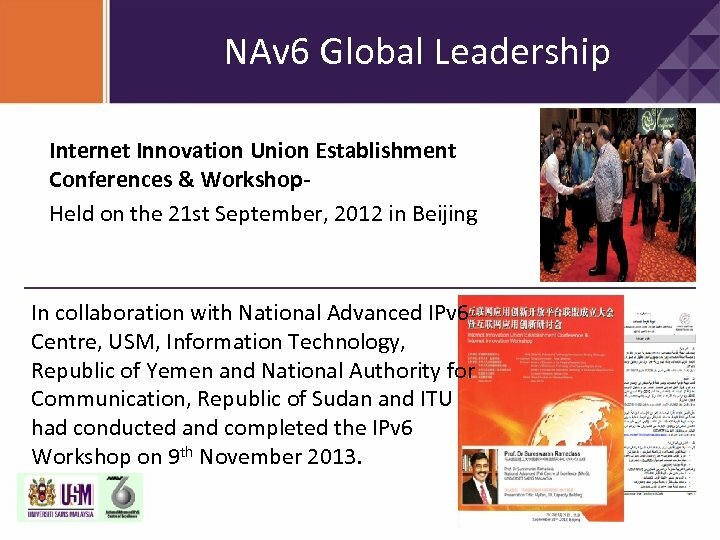 Held on the 21 st September, 2012 in Beijing In collaboration with National Advanced IPv 6 Centre, USM, Information Technology, Republic of Yemen and National Authority for Communication, Republic of Sudan and ITU had conducted and completed the IPv 6 Workshop on 9 th November 2013.